Savant’s Apple®-based Smart Home Solutions are designed to deliver an unprecedented level of efficiency and simplicity, providing each user with a streamlined smart home technology experience. 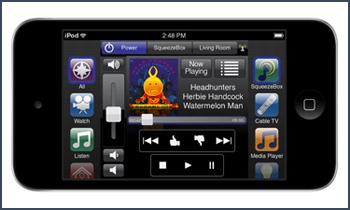 From pioneering and award-winning User Experience innovations like TrueCommand™ (On-TV Control Portal), TrueControl™ (iPad®, iPhone® App) and the Savant Select™ remote—to the most intelligent and feature-rich SmartSystems delivering home automation, whole-house audio video, home theater entertainment, unlimited media access and more—Savant’s control and media platform has no equal. Home Automation & Control — Savant puts you in complete command of virtually any appliance, device or technology in your home. 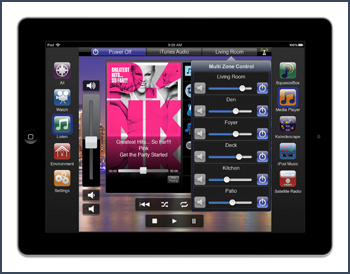 And you can retain the same level of control from a half-a-world away using your iPad, iPhone or iPod touch. Home Theater — From a streamlined media room, to a full-blown luxury home theater, Savant can deliver a rich and dynamic viewing and listening experience while also maintaining uninterrupted access to critical whole house technologies. Whole-House Audio — From smooth jazz to heavy metal, Savant's multi-room audio solutions provide easy access and distribution to vast libraries of media from any room in the house. Now everyone can enjoy a personalized environment filled with his or her favorite mood enhancing music. Intelligent Lighting — Savant provides one-touch access to numerous intelligent lighting schemes tailored to any lifestyle. As an example, one simple tap on your iPad or iPod touch remote can activate your exterior floodlights and turn off all interior lighting for nighttime security and energy efficiency. Climate Control — Savant’s home automation technology enables homeowners to monitor heating and cooling systems with total control of thermostats, window shades and draperies. Safety & Security — Left home in a hurry? With a single press of a button from an iPhone, homeowners can lock exterior doors, activate their security system and view surveillance cameras. Communications — Achieve complete in-home and external communication through robust iPad intercom features and a full IP integrated phone system from Savant. Energy Management — Smart Energy green technology from Savant allows homeowners to reduce energy consumption, conserve resources and save money, all without sacrificing comfort or convenience.